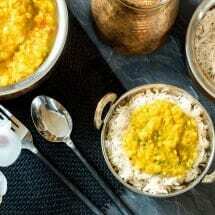 Pressure Cooker Rice and Dal is Indian comfort food made easy. 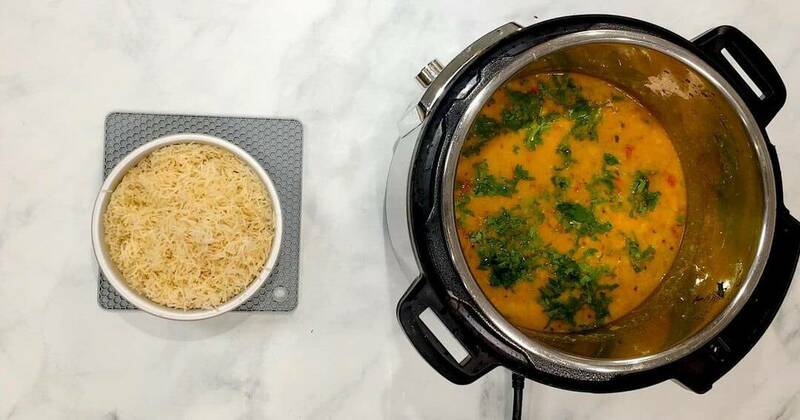 Once you learn how to make rice and dal at the same time in your Instant Pot, putting together a nutritious dinner will be easy as—well as rice and dal! 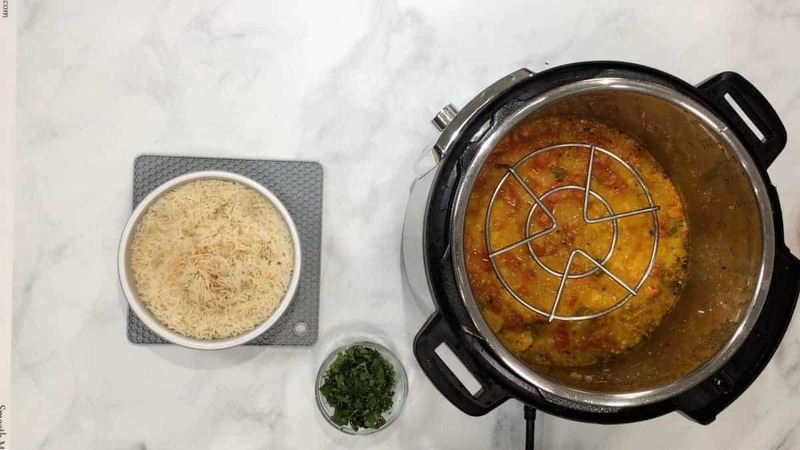 Ever wondered how to make rice and dal in a pressure cooker at the same time? Well, I’m about to show you. I made this rice and dal in my Instant Pot the other day and said to Roger, as I was eating my fourth bowl in two days “Gah! I love this so much I could eat it every day!” and then I realized, I DID eat it every day growing up. Unlike American meals where every day it’s something different, Indian meals have certain elements in common every day. We always have rice, dal, chappati, a vegetable, usually a salad/cold vegetable, a chutney of sorts, and plain yogurt. That’s right. Every day. Lunch and dinner. 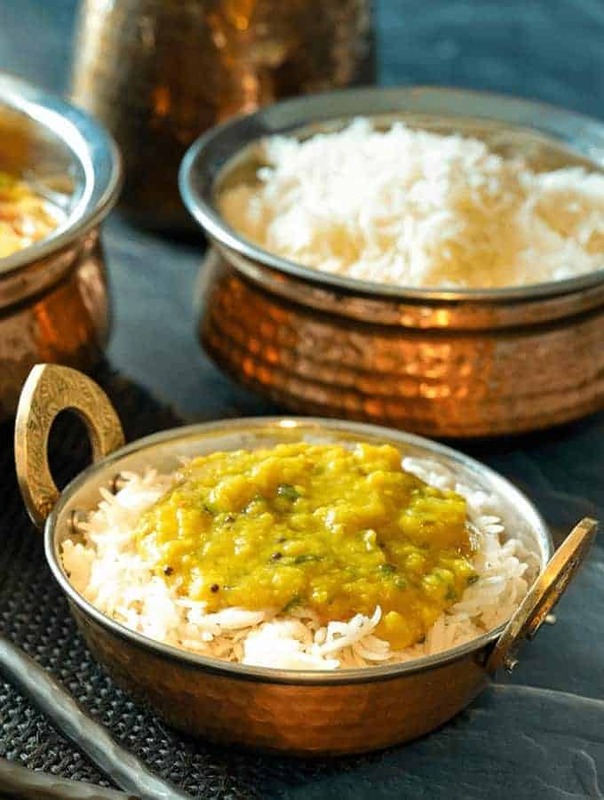 The type of dal, salad, vegetable, chutney might vary but dal and rice every day. All of which by the way, you can make if you get a copy of my best-selling book, , available on Amazon or at Barnes & Noble HERE! I have several pressure cooker dal recipes and many different rice recipes, but this is the easiest and simplest way to make everyday dal and rice. 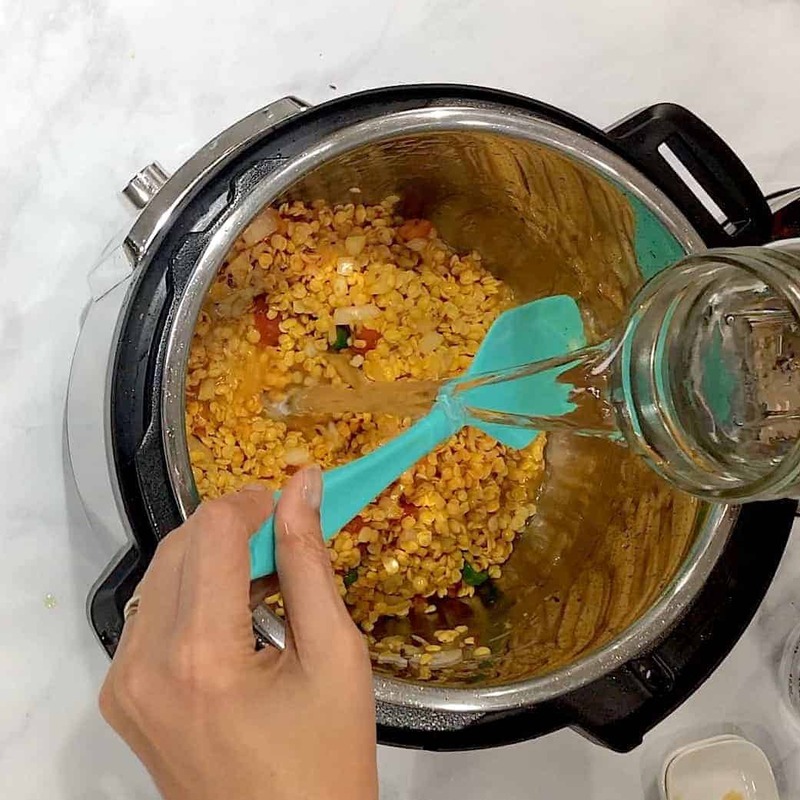 In fact, I even have a post on how to make rice and chana dal in your pressure cooker. The only difference is, that makes plain boiled dal that you then season into a pressure cooker chana dal fry recipe. In this recipe, the dal is already made when done, with no extra steps required. Even more efficient! It also tastes different from a day fry so it’s a nice way to mix it up a bit. For this recipe, I used Toor Dal. If you haven’t already, you really need to watch my Lots of Lovely Lentils Video and download the free slides that will teach you all about the various types of lentils, beans, and legumes. 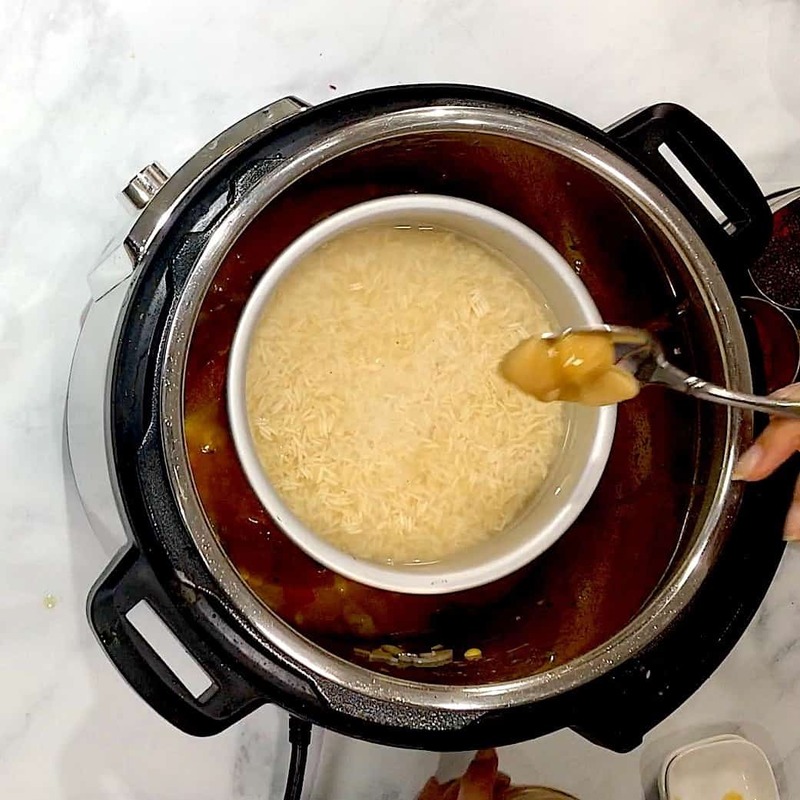 You can also learn how to make beans in your pressure cooker, and how to substitute various lentils for each other by watching that video and reading through those slides. You really should do it. It will open you up to a whole huge world of plant protein that you might not know enough about. Okay I am going to show you each of the steps here so we know how to do this. First, you heat the Instant Pot. When it’s hot, add oil. When the oil is hot, add mustard and cumin seeds, ginger, garlic, and serrano. Then, you’re going to add the onions and tomatoes, and all the spices. You just want to let the spices bloom a little. You put them on top of the veggies so they don’t burn. Add the dal, and the water. I’m using split yellow pigeon peas here, or Toor dal, but you can do this with any type of split lentils. Now here comes the magic. You will put a trivet on top of that dal. You’ll need one that has higher legs than the one that came with the Instant Pot. 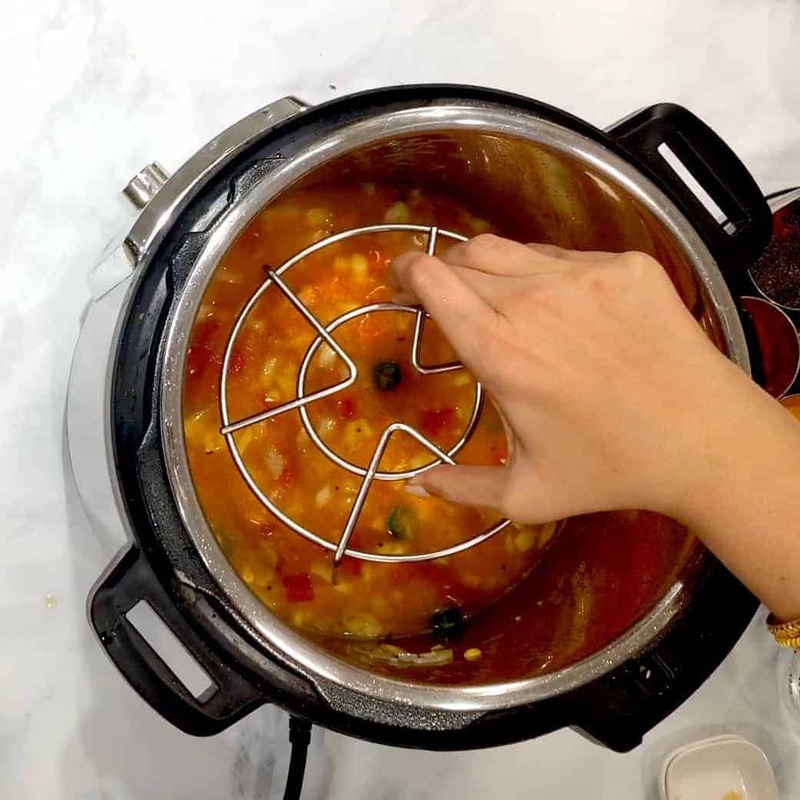 Note you can do this any electric pressure cooker or even in a stovetop pressure cooker. On top of that trivet, you’re going to put your rinsed rice, water to cook the rice, ghee, and salt. Notice I don’t cover the rice. You don’t need to. If you’re making some kind of cake or something that needs to be kept dry, that’s different. But for rice, I rarely cover it. Okay! When we were done, see how perfect that rice is? And underneath it, our dal is also well cooked. So you can add a little water to it now if you’d like it thinner. But other than that, your rice and dal and ready. Just look at that perfect rice! Every grain is separate, as it should be. Just add a little cilantro, brag about how you made dinner so efficiently, and eat! No really, it’s that simple. I used a 6 x 3 pan for this rice. Pressure Cooker Rice and Dal is Indian comfort food made easy. 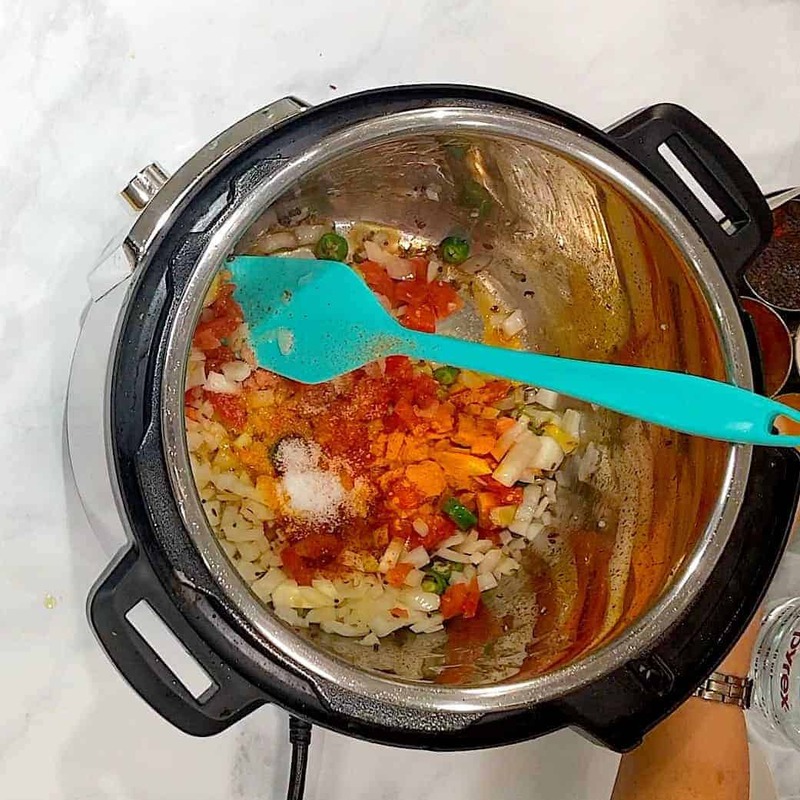 Once you learn how to make rice and dal at the same time in your Instant Pot, putting together a nutritious dinner will be easy as—well as dal and rice! In a 6 x 3 pan, add all ingredients of the rice, mix well, and set aside. (you can use a larger or smaller pan for the rice with impunity. It’s a pretty forgiving way to make perfect rice). Turn your Instant Pot on Sauté (high heat setting). When the pot reads HOT, add ghee, or coconut oil/oil. Once this oil starts to shimmer indicating that it is hot, add cumin seeds, mustard seeds, and the chili if using, and stand back. These seeds will sputter like popcorn within 10-15 seconds. 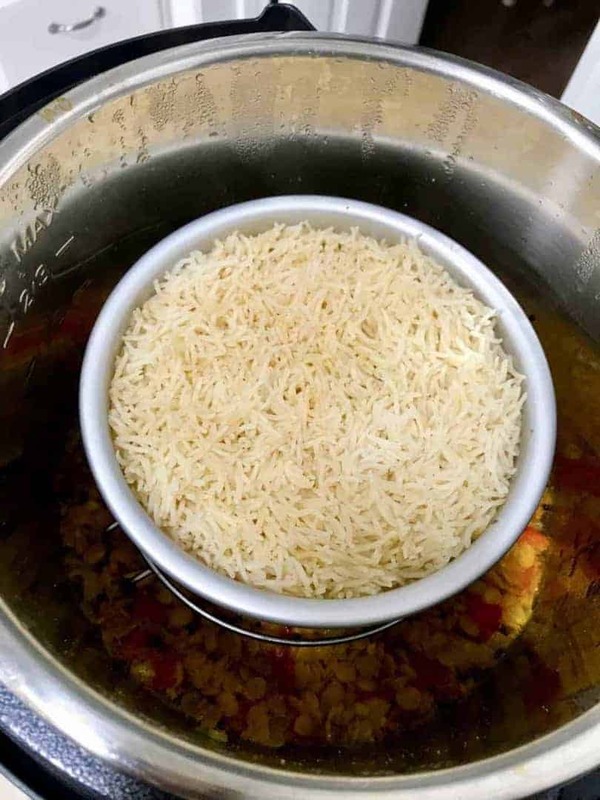 Place the pan of rice on the steamer. It is not necessary to cover the rice. Using little silicone mitts, carefully remove the rice, as well as the steamer rack. Check the consistency of the dal. You want a thick mixture akin to porridge. 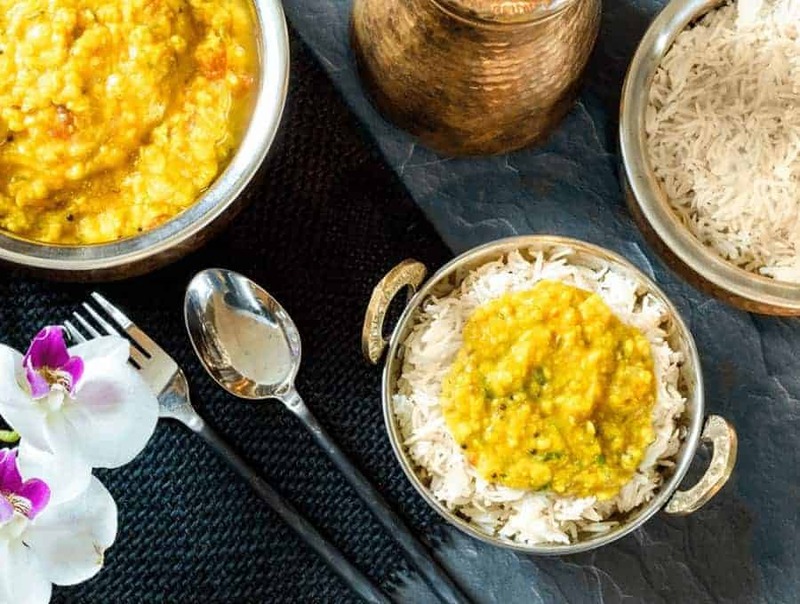 Serve each bowl with rice and dal, and pass around some extra ghee or whatever you’re using as a substitute to pour over your piping hot and lovely rice and dal. I made this exactly as described, except using green lentils..result is WAY too watery- its soup…the recipe calls for 2.5 cups of water..is that right? Hi there. Whole lentils and split lentils don’t cook the same way. The split ones in this recipe get all soft and tender and mushy, and therefore thickened. I’m guessing your Greek lentils didn’t thickened and mushy. Could any other lentils be used in this recipe? I only have access to brown and red lentils. Would using either of those change the cooking time or the water amount added? 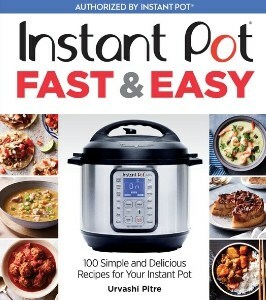 Thanks, I am receiving my first Instant Pot this week and I’m looking forward to cooking some of your recipes. I tried this recipe using chana dal (yellow split peas) and it came out fantastic. Do you think I could use moong dal in place of the toor dal? I am of South Asian descent so I am very familiar with the Indian cuisine. Urvashi Pitre is outstanding with the taste and ease of the recipes. I really appreciate the information you also provide. If you’d like to try Indian cuisine then these are the recipes you and your family will love. The butter chicken is amazing as is the dal! Hi! I really want to make it this way. 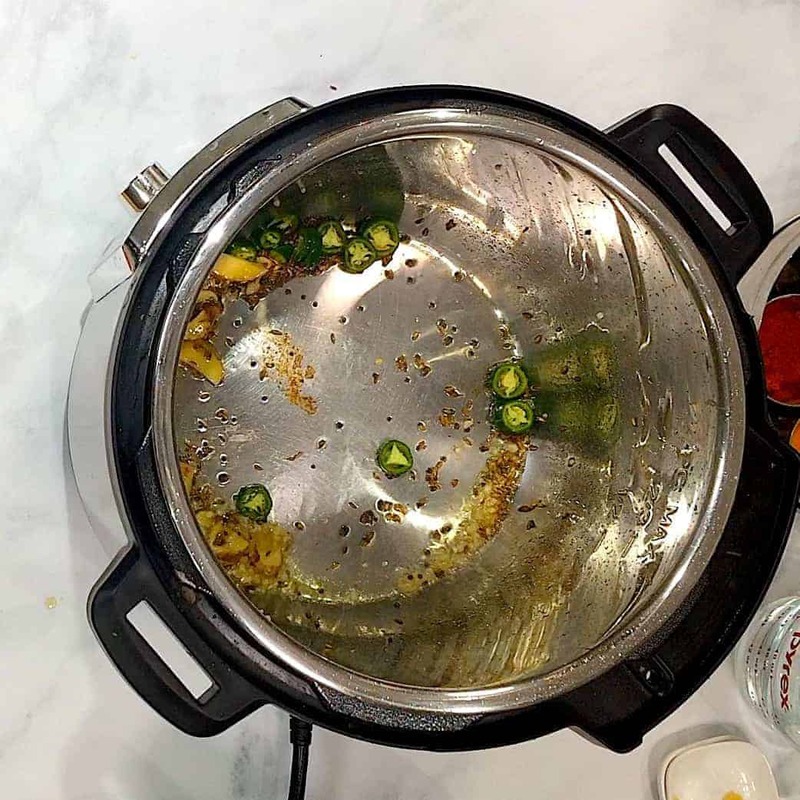 What type of pot did you use inside the Instant Pot?? Anything that’s 6 x 3 or 6 x 4 and heat safe works. Is there any way to let the dal remain liquid in texture even after storing it in the refrigerator? I find that once I put it in the refrigerator, the dal clumps together. I have to add a little bit of water every time before heating it up. I add water if It has been refrigerated and I am having dal-baht but if I have a particularly soupy curry, then I sometimes use it thick. Another thing that can be nice is to hit it with a stick blender and turn it into a hearty soup. This looks delicious! Would it be possible to do quinoa instead of rice? How would the cooking time change? Quinoa cooks in 1 minute under pressure. Even with pot-in-pot, it MAY be too much cook time.I haven’t tried it though so I could be wrong. This recipe looks fantastic and I’m trying it tonight. If my top of my rice bowl is above the max fill line on the IP is that a problem? (It’s sitting on the trivet so seems high …). Thanks! How much ginger do you add. The recipe says “4”, is that a 4″ piece of ginger, 4 teaspoons? 4 slices? I just bought an IP 3 quart Mini and I bought your cookbook at the same time. However, my IP does not have a Manual setting. Lots of your recipes call for putting it on Manual. So do I use the Bean setting instead? Also, you call for the tall trivet to do beans and rice together. Is there one for the 3 quart?Thank you so much! I’m looking forward to cooking these recipes. Honest to goodness, love this site! I can’t wait to make this for my wife! I just bought my first IP and have been scouring the internet for delicious recipes that aren’t all rib-sticking, Midwestern spinoffs. I feel like I hit the jackpot! This is my new favorite website and I cannot wait to try out all these delicious international flavors! I literally went through all 16 pages of your IP recipes tonight. Please, keep it up! Nice!! So glad to hear that. My Facebook group has lots more from different countries as the group members are quite an enterprising bunch from all over the world.